Since Bitcoin broke out from the $4,200 range in early April, we have started to see some significant buy support to protect the decentralised asset class from falling below the key psychological level of $5,000. After the historic figure was first reached in early September 2017 – on the wave of JP Morgan CEO Jaime Dimon labelling BTC a scam and claims about China potentially looking to “ban Bitcoin” – the market bounced off $5,000 to trade all the way back down to $3,000 in a matter of only two weeks. However, after Bitcoin looked to have found a new tranche of people “buying the dip” at $3,000, price again took off to reach and rally past the same $5,000 level in October that year. From then on, Bitcoin used the $5,000-$5,400 levels of support on three distinct occasions in the following months before price moved ahead with another parabolic advance to reach $20,000 by the end of 2017. 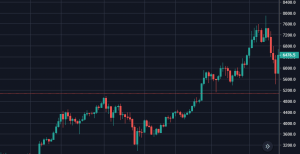 In seeing Bitcoin bounce from $5,100 once and $5,400 twice on that run-up, many in the community pencilled in this range as a key psychological price point where buyers would always be found on the way to Bitcoin breaching the five-figure price point of $10,000. When the crypto markets tumbled in November 2018, the $5,000 level did not come to the rescue again. As price breached this mark, it did not take long for the price to fall all the way back to the very same $3,000 level that BTC found support at back in mid-September 2017. This time the run-up was certainly not so simple, with Bitcoin retesting and finding support just above $4,000 before it finally broke out on April 2nd. Since the breakout, over the course of a week, Bitcoin managed to hold above the very same $5,000 level and in fact move on to make a couple of higher highs. Following yesterday’s fake-out as Bitcoin failed to break out of the $5,500 range, the markets dumped back down with not an insignificant amount of volume to take price back lower. Many margin traders are currently calling for at least a short-term pullback in prices back to at least halfway between the current price and the $4,200 level that price exploded from for ‘no reason’ last week. Personally, I am not so sure the $5,000 level will be that easy to break below again. If it can hold and we see a rally up to $6,000 in the next few days/weeks (signifying the start of a new bull market), then I can’t wait to hear what upside targets the technical traders will be hoping for based on prior parabolic advances we have seen for this global asset class.